Located in Rusk, Texas. This challenging little nine-hole tract has long been known for its natural beauty and layout. It is quickly becoming a destination for golfers of all abilities. A sea of color greets golfers in the spring. Flowering dogwoods, redbuds, and azaleas are bountiful among the cathedral pines and rolling terrain. Native wildlife is plentiful, with deer a frequent visitor. More than 2000 animals from 250 species from Africa, North and South America live in natural habitats at the 85-acre park. The zoo includes a children's petting pen, two aquariums, picnic areas, a café that overlooks an African savannah and gift shops with original African items. The zoo also has seasonal presentations including: a bird show, alligator feedings, giraffe feedings, and elephant demonstrations. The natural beauty of the land takes precedence here and the homes are carefully placed in the natural environment with many homes overlooking the lake, the golf course, or preserve areas.The 18 holes of Eagle's Bluff golf course wind their way through some of the most scenic vistas in East Texas. Regardless of your abilities, the course will provide ample challenge. Since 1896, trains have rolled along the Texas State Railroad (TSRR), passing through the beautiful piney woods and rolling hardwood creek bottoms of East Texas. Today, the historic state railroad is still maintained as a fully self-contained railroad system. Its train crews maintain and operate 4 steam engines, 4 antique diesel locomotives, and a complete steam engine restoration shop; while its track crew maintains over 25 miles of track and 24 bridges. Hands-on family fun for kids of all ages. View bats in the bat cave, trigger an earthquake into motion under your feet, snake your way through mysterious tunnels and explore the depths of a limestone cavern. Investigate the bones of "Big Ethel", the triceratops dinosaur. The Discovery Science Place offers three exhibit halls where kids of all ages are free to move around and explore. So, come be a kid again! Mon-Sat: 9am-5pm, Sun: 1-5pm. Admission Fee. The Stephen F Austin Arboretum is a ten acre garden along LaNana creek at Stephen F. Austin State University, Nacogdoches, Texas. The gardens began in 1985 as a small garden project on the south side of the Agriculture building, a project of the first Landscape Plant Materials class taught by Dr. Dave Creech. 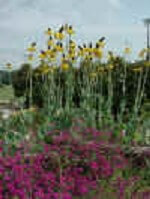 Over the years, the gardens expanded into one of the most diverse collection of plants in the South. Tiger Creek Widlife Refuge (TCWR) is an "Incorporated Animal Shelter" for the big cats. Tiger Creek provides rescue and rehabilitation of big cats that have been abused, neglected, or displaced. Tiger Creek provides a place for these great cats to live the remainder of their lives without threats in a stress-free environment that caters to the well being of the cats. Fourteen acres and 400 rose varieties testify to Tyler's standing as "America's Rose Capital". To view a wonderfully informative page about the Rose Garden, please click here. FREE Admission.